Vince Jordan, CEO and president of virtual reality production company Lobaki, will join the 15 Innovation Scholars and Innovation Fellows from 5 to 8 p.m. The students will learn from Jordan, a seasoned entrepreneur, about how he is engaging the community in his work. 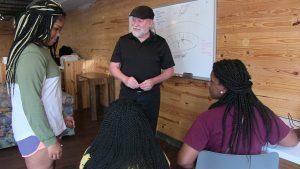 Lobaki has established The Virtual Reality Center and Academy in downtown Clarksdale as part of the Indigo Impact Initiative. The goal is to revitalize the Delta through technology and entrepreneurism through partnerships with Meraki Cooperative, the Crossroads Cultural Arts Center and the city of Clarksdale, including Clarksdale Public Schools. “We are excited to see how this new development in Clarksdale can impact entrepreneurship and economic development throughout Mississippi,” said J.R. Love, Catalyzing Entrepreneurship and Economic Development project manager. Jordan began the program in Clarksdale this summer to get young people interested in technology, hoping to make the town a tech hub for Mississippi. “We had good success with this program this summer and are looking forward to expanding it during this school year in the community and the region,” Jordan said. The event is open to the public. Formal remarks will be given at 5:30 p.m. by Jordan and Albert Nylander, McLean Institute director and UM professor of sociology. Jordan also will visit other units at Ole Miss, including the Center of Innovation and Entrepreneurship and the Center for Mathematics and Science Education. For more information, contact Love at jrlove@olemiss.edu.